Cardiovascular disease (CVD) is an overarching term used to describe a group of diseases that affect both the heart and blood vessels. The most common forms affecting Australians is coronary artery disease (which includes angina and heart attack), stroke, and high blood pressure. High blood pressure will also result in kidney disease. Factors that affect the heart and blood vessels and cause disease include smoking (both smoking and exposure to second hand smoke), high cholesterol, being over-weight, a lack of exercise, poor nutrition and diabetes. Many Aboriginal and Torres Strait Islanders either have CVD or are affected by CVD. The statistics for CVD show a rate of disease that is multifactorial in development, and is complicated by the need for advanced care to often remotely living Australians. One in twenty indigenous people have reported having high blood pressure and one in 25 have had heart, stroke or vascular disease or a combination of these (Australian Aboriginal and Torres Strait Islander health survey 2012-2013). These heart and related conditions occurred 1.2 times more often for Indigenous peoples than for non-Indigenous people. 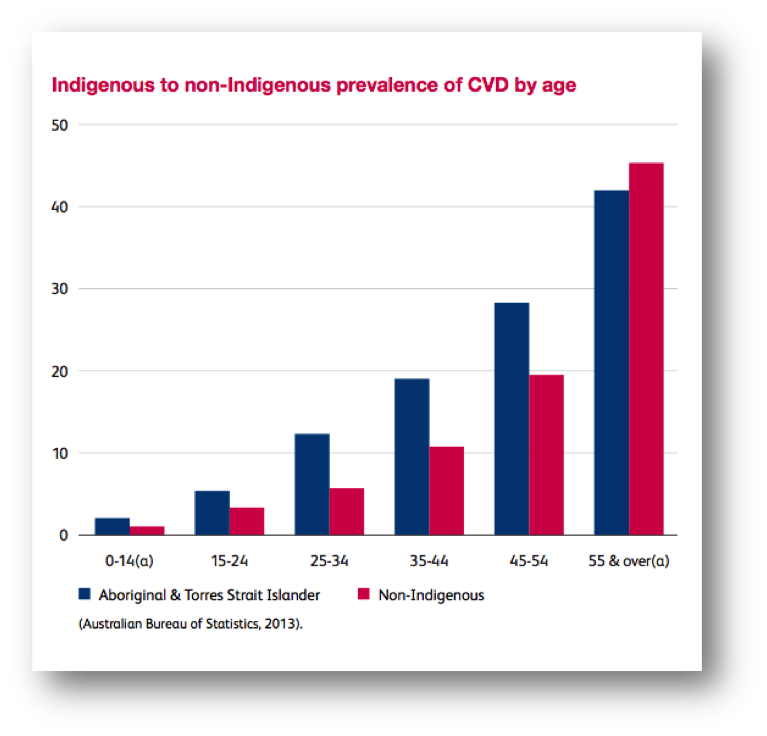 Indigenous people are more likely to die from CVD when they’re young or in middle age than non-Indigenous people. In 2009-2010 in NSW, Qld, WA, SA and the NT, the death rates for all coronary heart disease (the leading cause of CVD-related deaths) were seven to thirteen times higher for Indigenous people in the 25-39 and 40-54 years age-groups than the rates for their non-Indigenous counterparts. Sydney LHD, Royal Prince Alfred Hospital and medical professionals from The Baird Institute are involved in addressing cardiovascular and cardiothoracic needs of Aboriginal and Torres Strait Islanders as a direct health care approach for indigenous people accessing Sydney LHD healthcare or through resources developed by the Australian Department of Health and through individual philanthropic work. National Chronic Disease strategy for all Australians and recognises the need to value cultural differences of Indigenous Australians and barriers to accessing health care. Rheumatic fever strategy – preventing and treating oral and bacterial causes of the disease which results in heart valve failure. Cardiac geographic information system – a project that provides primary care services with further knowledge of cardiac rehabilitation against areas of cardiac disease prevalence. Medical specialist outreach assistance program – funded by the Australian Department of Health to improve Indigenous peoples’ access to specialist medical services when living in rural and remote regions of Australia. Indigenous chronic disease fund aims to target three areas of priority to prevent and reduce the disease burden of CVD, including tackling risk factors, identifying services that can deliver results and fixing the gaps and improving the person’s journey through the health care system.